The High Point Inn is a full service resort located on the very North end of Ephraim. This is a great location, right in between the villages of Sister Bay and rest of the town of Ephraim. No. 105, for example, is a 2-bedroom, 2-bath suite with fireplace, patio, master bedroom with king bed, and adjoining bath with whirlpool, more. There are plenty of attractions just minutes from your door. Many fine shops, galleries and restaurants are literally across the street. You can even enjoy miniature golfing right next door at one of our favorite spots, The Red Putter! This full service resort includes one, two and three bedroom suites with various floor plans, full sized kitchens, living rooms with fireplaces, an indoor/outdoor pool, game room, fitness center, and great guest services you would expect to receive at a resort of this type. The High Point Inn is easy to find, as you drive through Ephraim, start looking for the white fencing and beautiful flowers off to the right that line the road and entrance of the High Point and you have arrived! Once inside you will find a large gathering room that has two round tables set up for guest to sit and relax. Checkers and other games are readily available and there is plenty of reading material to enjoy including pamphlets and brochures describing local attractions, things to do, and various eating places you may choose to visit while on vacation. The gathering room also has a gas fireplace with a gorgeous oak mantle and built in bookshelf. 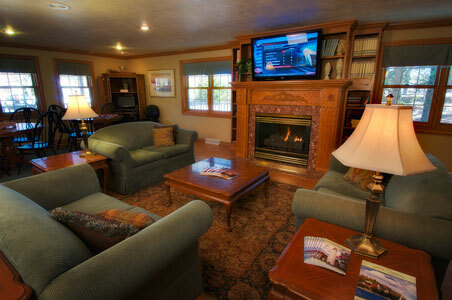 Three nice loveseats and a couple of comfy chairs are situated around the fireplace for you to enjoy. This room caters to your relaxation needs, is pleasant, warm and softly lit and decorated with local artwork from the Water Street Gallery. The front desk is beyond the gathering room on the left and a beautiful stairwell leading to the second floor of the main building is on the right. There are display cases hanging in the hallways of the first floor displaying very nice Door County apparel including hats, t-shirts, sweatshirts and baby “onezies”—neat! We enjoyed viewing other displays showcasing local artwork, pottery and swimwear. The High Point has been recognized for its continuous commitment to providing its guests with excellent service and hospitality. While we were admiring the awards hanging on the wall near the front desk, we ran into one of the owners, Doris Simonson. We asked her what she liked best about the High Point, and without hesitation she answered “it has a great location and is always beautifully kept inside and out.” We agree! We took the time to walk the entire property with the general manager. All the rooms we toured were clean, spacious and inviting. There are several floor plans to suit your needs. You can choose a one bedroom suite with either two double beds or a king bed, two bedroom suite, or a three bedroom suite perfect for larger families or up to 6 adults with comfort (not counting the sleeper sofa). 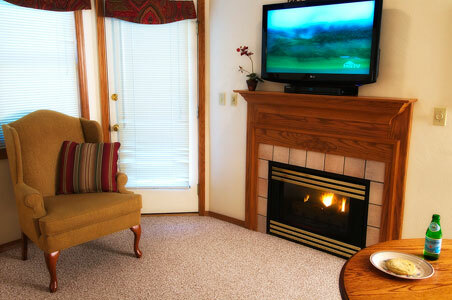 All the suites have full kitchens, sleeper sofas and living rooms with fireplaces. Here’s a look at a couple of rooms in more detail. This is a two-bedroom, two-bath suite. The kitchen is to the right as you walk in and is equipped with all the modern appliances you need, and has oak cabinets. A stainless steel sink built into an island offers adequate counter space on one side and serves as a breakfast counter on the other. Separating the kitchen and the fully carpeted and roomy living room is an oak table and four chairs. The living room sports a double sleeper sofa, coffee table, end tables and fireplace with TV/VCR built in overhead. To the left of the fireplace is a door that leads to a very nice covered patio that has a larger oval table with four chairs on one end, and two more chairs and cocktail table on the other. Nice! The master bedroom offers a king bed, dresser, larger clothes closet with bi-fold doors, and a handy floor to ceiling closet with two storage drawers for even more storage space for your things. There is a good-sized window that looks out over the patio to a peaceful natural setting. Quiet, picturesque—nice. The bathroom has a standing shower, is very well lit and nicely appointed. There is a smaller but very cozy double whirlpool tub as well. 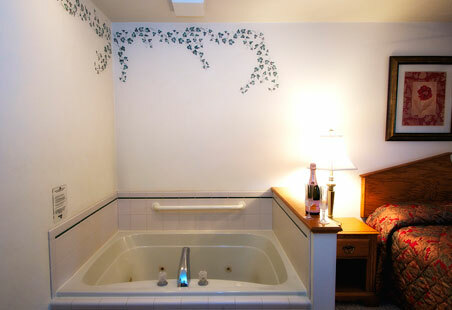 The guest bath in this suite is very spacious, nicely decorated and features a full tub and shower unit. We were pleased to see the size and roominess of the guest bedroom. There is enough room here for a sitting chair, TV, two storage closets, two nightstands and a dresser. It also has the same view as the master bedroom. Overall, this bedroom is very nicely laid out, not an afterthought like some second bedrooms, no skimping on the space here! This is a three-bedroom, two-bath suite. It has the same handy kitchen as Suite 105. Remember that the kitchens come with plenty of cabinets for storage and all the little things you need like serving bowls, plates, glasses & serving utensils. Once you get beyond the kitchen, the room opens up into a large living room/ dining room area. There’s a very nice oval oak table with six chairs perfect for both eating and entertaining. We liked the large covered patio – offering a great view and equipped with outdoor furniture. Overall, the living room has a nice layout, providing plenty of room for everyone. The master bedroom has the same warm and comfy layout as Suite 105, and once again, BOTH guest bedrooms provide plenty of room for your things. They both have TV’s (nice touch not found everywhere) and one has a sitting chair while the other features a door leading to the patio. If you’re traveling with three couples, no one will be disappointed with the room assignments. The High Point Inn Resort has both indoor and outdoor pool areas. The indoor pool area has a super mural of children playing on a sandy beach with a view of Peninsula Park and Eagle Bluff painted on one of the walls. It is huge and impressive - we thought it was very cool! The floor is completely tiled and there is a handy bathroom just outside the pool area across the hall. Like many of the resorts in Door County, the indoor poolroom sports a knotty pine vaulted ceiling. There is also a ten-person hot tub and plenty of chairs and tables (two with umbrellas) to utilize.e outdoor pool is very impressive. It is completely surrounded by a white iron wrought fence that provides a nice backdrop for the extensive rock gardens and flowerbeds that line the perimeter of the pool area. There are lots of tables, chairs and umbrella’s placed about and we counted eighteen lounging chairs perfect for sunbathing or napping. A gate leads to a children play area and two outdoor grilling patios. There is also another nice outdoor grilling patio just outside room 109 so ask the front desk if it’s available if you enjoy outdoor grilling! The High Point Inn also has a game room for the kids, exercise room and conference room on the second floor that can hold up to fifty, While not is use as a conference room, it is equipped with a ping –pong table set up - cool! Folks, if you’re looking for a resort with a great location, consider The High Point Inn - it really is located in a fabulous spot and you will be very pleased with the accommodations. And they are open in winter too! They have a great website that allows you to take a virtual tour of the rooms so check it out at their website above. And please tell them that DoorCountyNavigator.com sent you to them - that helps keep this site alive & well for you - and you can help!